A rational exploration of the ethical and welfare issues in all areas of equine use. This book addresses controversial and emotive issues surrounding these iconic creatures, providing a reliable source of information to support informed debate. It will enable all those with an interest in horses and the uses they are put to gain an awareness of the problems and abuses that occur. The book draws on the expertise of a range of acknowledged leaders in equine health and welfare. The first part of the book explores general issues of the horse’s needs and nature. The second part contains chapters each covering a specific human use of horses and the abuses that arise as a result. Bernard E. Rollin is University Distinguished Professor of Philosophy, Biomedical Sciences, Animal Sciences, and University Bioethicist at Colorado State University, USA. C. Wayne McIlwraith is University Distinguished Professor, Barbara Cox Anthony University Endowed Chair in Orthopedics and Director of Orthopaedic Research at the Orthopaedic Research Center, Colorado State University, USA. The Universities Federation for Animal Welfare (UFAW) is an internationally recognised, independent, scientific and educational animal welfare charity concerned with improving knowledge and understanding of animals’ needs in order to promote high standards of welfare for farm, companion, laboratory, captive wild animals and those with which we interact in the wild. Part I Respecting the Horse's Needs and Nature. 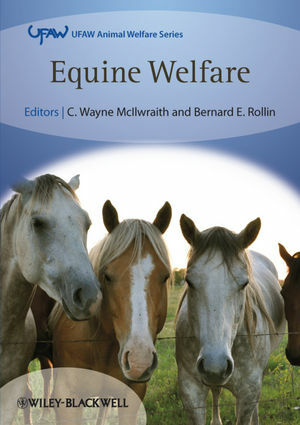 1 Equine Welfare and Ethics (Bernard Rollin). 2 A Historical Survey of Human–Equine Interactions (David W. Ramey). 3 Equine Health and Disease – General Welfare Aspects (D. Paul Lunn and C. Wayne McIlwraith). 4 Nutritional Management of the Horse (Joe D. Pagan). 5 Equine Psychological Needs and Quality of Life (M. Kiley-Worthington). 6 Spirit and Wellness in the Horse (Andrew F. Fraser). 7 Pain and its Management in Horses (Laurie Goodrich and Khursheed Mama). 8 Euthanasia as an Equine Welfare Tool (Jay G. Merriam). 9 Equine Welfare and Integrative Veterinary Medicine (Kevin K. Haussler). 10 Alternative Medicine and Equine Welfare – Challenging the Science (David W. Ramey). Part II Human Uses and Abuses – Welfare Issues. 11 Welfare Issues in Horse Racing (Rick M. Arthur). 12 Abusive Treatment and Subsequent Policy Development within Various Breeds of Show Horses in the USA (Jim Heird). 13 The Horse as a Companion Animal (Nancy S. Loving). 14 Welfare Issues in the Rodeo Horse (Doug Corey). 15 Welfare Concerns in the Training and Competition of the Cutting, Reining, and Reined Cow Horse (Jerry B. Black and David Frisbie). 16 PMU Ranching and Equine Welfare (Nat T. Messer). 17 Welfare in the Discipline of Dressage (Midge Leitch). 18 Raising Welfare Standards for Endurance Riding (Nancy S. Loving). 19 Welfare Concerns in the Care, Training, and Competition of the Hunter–Jumper (Richard D. Mitchell). 20 Welfare of Horses, Mules, and Other Equines in US Agriculture (Josie L. Traub-Dargatz). 21 Welfare Issues with the Carriage Horse (Jay Baldwin). 22 The Horse and its Use in Research (C. Wayne McIlwraith). 23 The Unwanted Horse – a Major Welfare Issue (Tom R. Lenz). 24 The Welfare of Wild Horses in the Western USA (Albert J. Kane). 25 Welfare Issues in the Event Horse (Kent Allen).